9 September, during this week, on 13 September I start to ship the book to paying customers. 21 August, The book was printed today, It looks stunning! 19 August, the book is now at the printer and I will attend the printing process two days from now, on 21 August. The same date I will send out an invitation to all my old customers so they could preorder the book. Planned shipping date, according to my printer is 14th September, so "hold on to your hats" this would be my best profile book to date! 12 August, next week I have just some minor editing and mid week the book will be ready for printing, two weeks earlier than I have planned. Planned prining and publishing date would be presented as soon as possible. 29 July, I have just made the profile layout, with all texts, profiles and illustration now in place and ready for printing. Please check out four of the profile pages below. 22 July. Up today I have written 112 profile texts including 20 Japnese flown fighters. Now I only have 12 more profile text sto write, all of them Japanese. With a formate of 126 profiles in all, two more than I used in my earlier fighter profile books I will write the capter of the different Air Forces of Axis Air forces during WW II. 15 July, Today have written the 88th profile text for the book. So by now all Bulgarian, Slovakian, Croatian, Russian, Yugoslavian and most of the 17 Roamanian flown fighters has been done, I have just six more IAR 80 texts to write. Then I will finish of the work with the 32 Japanese Army Air Force flown machines. 4 June, By now all of the 28 texts for the Italian flown machines included in my new book is written. So by now close to half of the texts in finished. Unfortunatly next week, there would be no work on the book as I will travel to Germany for another research trip. 17 June, Working with the profiletexts I have during the last two weeks written 1/4 of them. So by now 33 texts is made, including all Hungarian, Spanish and Finnish flown fighters. Next up to write is the 28 Italian machines. 20th of May. 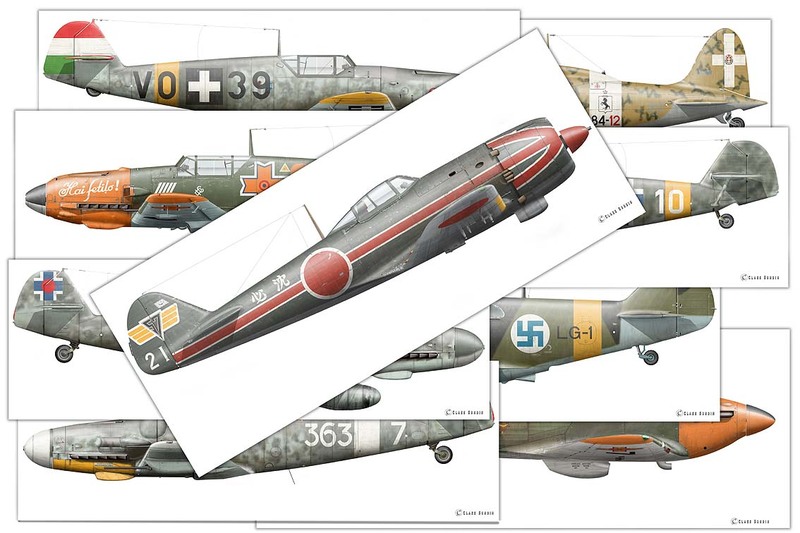 I´m currently working on the 126 profile texts for the book, starting off with Spanish flown fighters. Today, 8th of May (73 years since the war in Europe ended) I made the last fighter profile for my new Axis Fighter book, a Bf 109 G-10 flown by Cap. Cesare Marchesi. In all I have made 156 Axis Fighter profiles and would have to exclude 30 of them to fit the book format of 126 profiles. Now my work on the manuscript starts, writing the profiles texts and the Axis chaper, that would be great fun! Currently I'm working on the last of the eight profiles for the book, all Italian Messerschmitts. During this week I have also made five Spanish flown fighters including two Fw 190s. Please check out the two newly made profiles published below. 29th of April, Yesterday I made my eight and last Ki-44 profile. One of them is the well publicised machine of Capt. Yoshio Yoshida below. Next week I should round up with Spanish flown Fw 190s and Bf 109s. Then I will make the last seven profiles for the book, All Italian flown Messerschmitts. 22nd of April, Sorry to admitt but during the week I have not found any time for my new book. 15th of April, I have by others been working on the Ki-44 original this week. I guess I will have the first profile ready of this type during next week. So please check in and see my updates. 9th of April, during my Easter break I have manage to make another two Macchi 202s, five Macchi 205s and seven Macchi 200 "Saetta", including General Raffaelis machine below. Next profile type to be made is the Ki-44. 1st of April, Today I have made my eight new Macchi MC 202 for the book, including Lucchinis 84-1 below. I also updated two old Macchi profiles to my latest standard. During the next week I will get going on the Macchi MC 205"Veltro". 25th March, This week I have made the rest of the Croatian, Slovak and Russian flown Messerschmitts that should be included in my next book, including Franjo Dzals Bf 109 G-2. During next week I will get going on Italian fighters. 18th March, last week I made my tenth Hungarian Bf 109 for the book, next that would follow is Bulgarian and Russian flown Messerschmitts. 11th March, After one more week I have managed to make the last of the planned eight Finnish Brewsters. Thereafter I continued on the Hungarian theme to make Messerschmitts, one of which is Black 15 from the 101st Vadaszsazad. 4th March. This week, finally I have manage to make my first two Brewsters profiles, one flown by Lauri Perkuri an 18,5 ace and the second one was flown by the 3rd highest scoring Finnish fighter pilot, Captain Eino Luukkanen with 56 kills in total. Six more Brewsters would follow, all aces flown. 25th February, Today I will make my ninth Finnish "messer" for this book, at least one more will follow before I get going on the Brewster. 18th February, Today I made another Messerschmitt for the book. A machine flown by Lt. Laitinen, a machine in which he manage to claimed six VVS aircraft. 4th February, I had problems finding time for any work on this book during last week. 28 january, due to sofware problems I have not beeing able to work on my new book for a week. However everything is fixed by no so next week I will get going. 14th January. The Buffalo is coming along just fine, however the linedrawings had to be refine before I could start to make the first Brewster 239 original. 7th January, By now I have made 21 Ki-61 and Ki-100 profiles, 16 of them would be included in my new profile book. Next Figther type in line for me to make is the Brewster Buffalo. Soon to be publish on this page, Keep you updated! 22th December, All my Ki-61 profiles for the book is by now made, I will take some time off during the Christmas holiday but next week I will get going on the Ki-100. 17th December, Today I made my 10th Ki-61 profile for the book. I will make three more then I will switch to the Ki-100. 11 December, finally my Ki-61 original is finished, at least 10 more profiles will follow of this type. Today 10th December I have been vorking on a new profile type, the Ki-61. Keep updated as I will present the first original of this type this week. 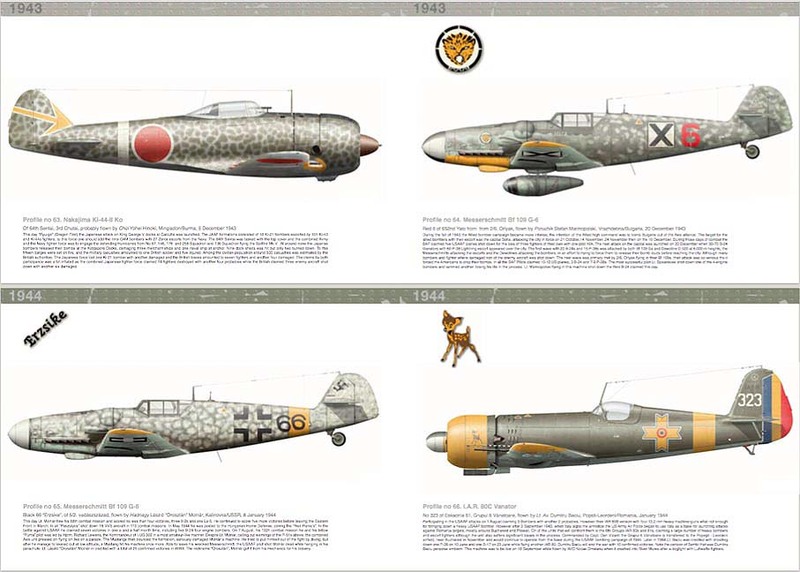 Up until today, the 3rd of December I have manage to make 54 Axis Fighter profiles for my new book "Axis Fighters". And this Sunday morning I made my seventh IAR 80 from the Royal Romanian Air Force, "Mamy" of Esc.47Vt. Up to today I have made 40 Axis fighter profiles for my next profile book, "Axis Fighter Aircraft, Profile Book No 8". In this book the reader would find Fighter aircrafts from Croatia, Slovakia, Yugoslavia, Romania, Japan, Spain, Hungary, Thailand, Iraq and Russia. In this book I will include types such as the Bf 109, Fw 190, IAR 80, Mc 200, Mc 202, Mc 205 Hurricane, LaGG-3, Brewster 239 Buffalo, Ki-44, K1-61, Ki-84 and Ki-100, all newly made and never published before.